AltNewsMedia exists to ask the questions the legacy media run away from. Readers will recall the Jihad attack at Westminster on the 22nd March 2017 carried out by Islamist Khalid Masood which cost the life of Police Constable Keith Palmer, along with five members of the public. Whatever he says, he was Minister for Counter-Terrorism, so surely he should have assumed responsibility, and pushed for changes? Instead, Ellwood was portrayed as a hero for comforting the dying PC Palmer. AltNewsMedia does not deny that Mr Ellwood gave the dying Police Constable mouth to mouth resuscitation and he deserves praise for that but nonetheless why did he accept the disarming of the police at the gates of Westminster? Did that not place police officers lives in peril? What consideration was given to the possibility of police officers facing armed terrorists at this gate? Who decided that it was a risk worth taking? 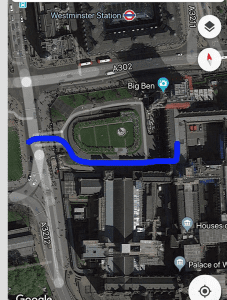 Obviously the police are now all armed (again) and the entrance to Parliament has been turned into a fortress but the British media has conspicuously failed to ask some basic questions. For example, why was not even a concealed handgun allowed? Remember, Ellwood was Minister for Counter Terrorism when this disarming at the gate happened. Around 40 yards from the gate, there is a door for MPs which goes directly into the lobby of the House of Commons floor, and one more door places you on the floor with the Prime Minister. 40 yards. If five men with AK47s had done it (rather than one demented terrorist), they could very easily have timed it to coincide with Prime Minister Questions (PMQs) and fired at all Ministers and MPs. The public doesn’t really understand the significance of the security failure here but in certain circumstances it could have been catastrophic. Here is how close the terrorist Masood came to gaining access to the Commons chamber. 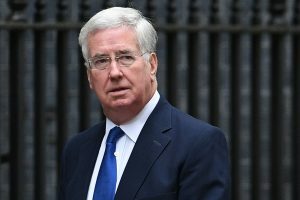 Khalid Masood was only shot because the then Defence secretary Michael Fallon happened to be walking out of the commons from that same door and he (of course) always had armed security with him. 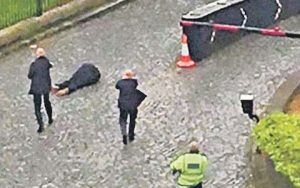 It was Fallon’s bodyguard that shot Masood dead. Nobody else at the gate was armed. It was simply lucky that an armed response bodyguard was there – as Fallon obviously wouldn’t have been walking out during PMQs for example and his bodyguard wouldn’t have been there. PC Palmer had decades of experience in HM Armed Forces and courageously stood to fight the machete wielding terrorist unarmed. This cost him his life. 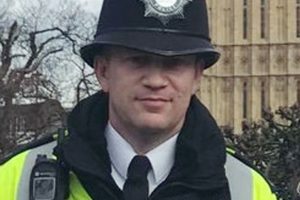 The brutal truth appears to be that had it not been for the decision taken to disarm police at the gates of Parliament, PC Palmer might not have died. A decision which, despite years of military experience, the Minister for Counter-Terrorism (Tobias Ellwood) appeared not to notice, and never acted upon. An armed response to the threat posed by Masood by those police officers on duty would have saved lives. Some politicians though they knew otherwise. 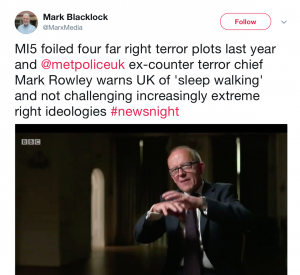 Mark Rowley was head of the counter terrorism dept at the Metropolitan Police during the time of this tragic incident. He recently revealed that he was deeply concerned about “extreme right ideologies” but somehow appears to have missed the extraordinary security risk at the epicenter of our democracy. Had he given any thought to the glaring gap at the heart of British democracy or was he to busy chasing “extreme right ideologies”? Political and Policing complacency costs lives in this era of sustained Jihad terrorist threat. Those in charge should be held accountable for any such lapses in judgement. Afrer all, ministerial responsibility means precisely that, doesn’t it?